Indigenization and decolonize are words that seem to be permeating institutional conversations in the heritage world and in the post-secondary field right now. Despite the frequent use of these words there are still many questions about what the terms mean and how they can be moved into practice. Approaches to Indigenization can vary greatly between institutions but often involve the integration of Indigenous cultures, heritage, and knowledge. In some cases this has involved required courses with Indigenous content or the incorporation of Indigenous content across all faculties. However as Adam Gaudry pointed out in his Active History post, “Paved with Good Intentions: Simply Requiring Indigenous Content is Not Enough” mandatory Indigenous courses are not new, can be problematic if they are not facilitated correctly, and should be part of larger institutional changes. Indigenous survey courses often fall into the traps of treating culture as a cure-all, looking at Indigenous communities without diversity, or framing Indigenous people as stuck in time. In other instances Indigenization has been approached as an increasing focus on Indigenous student success or resulted in the building of dedicated Indigenous spaces on campuses. While this is a worthy cause, Indigenous students face unique barriers in post-secondary institutions which need to be addressed and dedicated Indigenous spaces often come at the expense of students becoming separated or othered along cultural, ideological, socioeconomic and colour lines. Indigenization cannot be attempted without first making space to decolonize what types of knowledge the academy sees as legitimate, otherwise projects have the potential to become tokens used to absolve settler guilt. 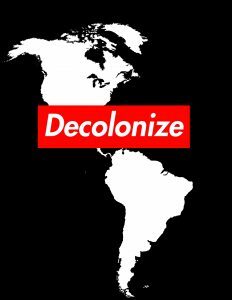 Decolonizing often means identifying colonial systems, structures and relationships and working to challenge those systems. Decolonizing frequently goes hand-in-hand with Indigenization and is a response to the inherent colonialism in Canada. Decolonizing practices work to transform what is important in settler society and involve long-term structural changes. Decolonial pedagogies reflect a desire to help students learn and recognize existing structures of colonialism and to engage in activities that challenge those structures. It’s impossible to change a structure if you don’t understand how it exists – decolonial education practices start at the very basic and focus on explaining cultural difference and colonialism. Once this understanding has been established the reclaiming, reshaping, and transforming spaces and structures to meet the needs to Indigenous communities can begin. So what can historians do to decolonize and Indigenize their professional practices? The following list is by no means exhaustive but it is a starting point of a conversation on ways to change teaching and research practices. This also means exploring diverse Indigenous voices in your syllabus (Inuit, Métis, bi-racial, urban communities, two-spirit, and others). There is a huge range of diversity within Canada’s Indigenous communities and one experience doesn’t speak for them all. What brought your ancestors to this land? Do you know the history of the land you live/work on? Is that encompassing indigenous histories or just settler narratives? Have your family or ancestors been impacted by colonization, oppression, structural violence or war? How have you as a settler benefited from any of those systems in North America? What does reconciliation mean/look like to you? How can you foster reconciliation in your day-to-day life? Acknowledge the traditional land you’re residing on as part of this location exercise. Unsure of where you’re located? See the CAUT Guide to Acknowledging Traditional Territory. As Anne Janhunen has argued that “[o]ne of the most effective ways we can challenge settler colonialism is to examine it within our local contexts, by asking questions such as ‘what are the Indigenous histories of this area, and how have they been overlooked or erased within local historical narratives?” Ask and discuss these questions in the classroom and in any local history interpretation you undertake. Consider how you are discussing historical topics that are also present day social justice issues (treaty relationships, colonization and present day land use, residential schools, the pass system etc). Do the work. Marginalized communities should not be expected to teach about the basics of colonialism, racism, and white privilege. Do the research and control the space. Do not expect Indigenous students to fill in syllabus gaps when addressing Indigenous issues in the classroom that you have not fully researched. Do not let settler students create a hostile environment to which Indigenous students are left to fend for themselves; this is colonial violence. Learn the protocols for working with Indigenous communities and knowledge keepers in your region. Understand that Elders and Traditional Knowledge Keepers should not be expected to work for free. Provide an honorarium if you’re inviting them to speak to your class. Also understand that building relationships with Elders and communities can take years. Practice “Nothing about us, without us” in your research. Work shouldn’t be done about Indigenous communities it should be done in partnership with them. The Truth and Reconciliation Commission of Canada explicitly called on Canadian universities and colleges to create programs in Indigenous languages and to change existing programming in medical, nursing, education and law schools to include the history of residential schools. A number of the broader Calls to Action also implicate post-secondary institutions in larger national relationships with Indigenous communities. How each school, historian, and scholar tackles decolonization and Indigenization is going to be different but in many cases we don’t need to work from scratch and can build off existing examples of good practice. Skylee-Storm Hogan is a undergraduate student studying Law & Political Science and an Archive Assistant at Algoma University. Skylee-Storm is Kanien’kehá:ka, her ancestors originating from Kahnawà:ke, she lives and works in Robinson-Huron Treaty territory on the traditional lands of the Anishinaabe and Métis people.